Large elastic artery stiffness increases with age and menopause is a mitigating factor in women. 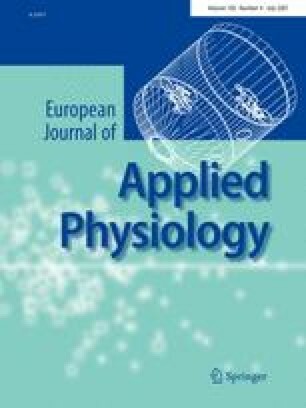 High-intensity resistance training (RT) increases arterial stiffness in young men and women. However, the effects of moderate intensity RT on central aortic pressure wave reflection in healthy postmenopausal women are unknown. Healthy sedentary normotensive postmenopausal women were randomly assigned to either 18 weeks (2 days/week) of RT (RES n = 13) or aerobic training (AER n = 10). Central aortic pressure wave reflection and brachial artery reactivity were assessed before and after training. Central aortic pressure wave reflection was evaluated by measuring aortic augmentation index (AIa) and round trip travel time (Δt p) of the reflected arterial pressure wave using applanation tonometry. Brachial artery reactivity was assessed using brachial artery flow mediated dilation (FMD). Eighteen weeks of RT did not change AIa (28.9 ± 1.9 vs. 28.5 ± 1.9%; mean ± S.E.M.) or Δt p (140.6 ± 2.4 vs. 141.2 ± 2.1 ms). In contrast, the AER group showed a decrease in AIa from 28.8 ± 2.1 to 25.1 ± 1.4% (P < 0.05) and an increase in Δt p from 137.3 ± 2.5 to 144.6 ± 2.9 ms (P < 0.05). Brachial FMD did not significantly change in either group following training. This prospective, randomized study demonstrated that moderate intensity whole body RT in previously sedentary, normotensive postmenopausal women does not alter central aortic pressure wave reflection.